Deluxe 7/8" span coupler lever lock. The TC1 features a triple plated chrome finish. 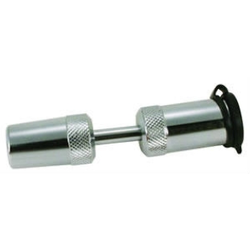 Provides additional security for your camper, boat or trailer by securing the coupler on your trailer tongue. Also secures trailer door latches, cargo boxes and other types of doors. Features patented 1/4 turn technology that cannot be false locked.